Be careful when buying field grown banana tree offshoots. offshoots (corms) have sword like thin leaves until 3' tall. the Ice Cream is the hardiest of edible bananas. or to get a replacement or refund with returned plant. Fl. and try to give 100% Top Quality service. can be grown in full sun, shade or inside your home. We have a perfect record with the Better Business Bureau. All small plants are 2 months old not 1 month like most sell. Dwarf Cavendish banana tree - banana plant shipping Now. trees have large bunches of full sized sweet smooth fruit. cooked. Mature banana tree height 12'. approx. Approx. only reach 3-5 feet unless grown in a very large container. and solid maroon coloring on the bottom. Beautiful approx. for collecters. Real nice approx. 12" size banana plant. plants reaching up to 12' with good growing conditions. Very sweet dessert banana. Nice healthy approx. 12"
growing banana tree. It is green leafed with a red midrib. bananas. Very thin skined when ripe and super flavor. container growing as in the ground. Nice looking too. Healthy approx. 12" high banana plant shipped with soil. type fruit is one of the most beautiful. It turns "sunset"
Cavendish banana plant variety that only gets 3' high. Produces excellent dessert type fruit. Great for indoors. Has red bloches on leaf top, a beautiful potted plant too. Nice 1 month old plant shipped with soil. bananas... Approx. 12" tall healthy banana plant shipped. protected areas. Healthy approx 12" plant with soil shipped. grows rapidly. The small fruit are very sweet and delicate. 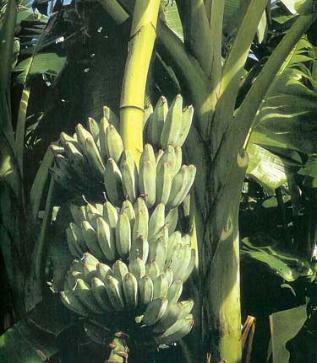 This banana tree is resistant to fusarium wilt, grows 6-8 ft.
tall. Approx. 12" high healthy banana plant shipped. is an outstanding producer of delicious tasting bananas. Healthy approx 12" high plant with soil. collectible. Healthy approx. 12" tall plant with soil shipped. to make fruit until it touches the ground (sometimes 5 ft.
however the fruit is edible and sweet. Banana Leaves for Cooking 2 Big Banana leaves (approx. med. pig. Shipped by priority mail. family as lilies, orchids and palms. classified into the genus Musa of the Musaceae family. banana plant bulb will sprout new shoots year after year. be cultivated from the main banana plant. each other like celery stalks. around the bud unfold and banana blossoms are revealed. Each female blossom becomes an individual banana fruit. expose a new hand of flowers almost daily. untill spring. This is the best way for most. half the rate for outside plants. silver-green color. And the fruit is blue-green. rate this is the best tasting banana.